Life is so crazy right now! I’ve got midterms starting this week, a research proposal due Monday, loads of homework and, of course, SushiDay! Not that I’m complaining, of course. 🙂 But if I seem to disappear every now and then, you’ll know why! 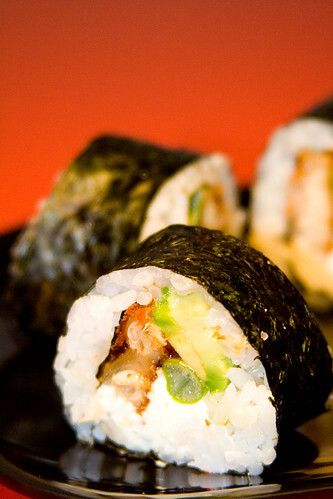 Roll the sushi, using unagi, imitation crab, avocado, and cream cheese as your fillings. I do agree with Ralph! 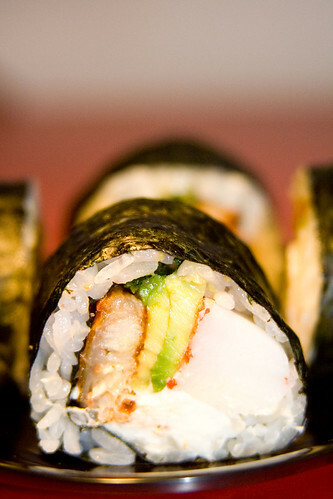 And while we’re on blasphemous subjects, have you ever made (or had) sushi with brown rice? I love brown rice but I’ll be the first to admit it doesn’t taste as good in sushi…at least, the way I had it. But, I suppose it IS healthier. Just curious! Yvo – 😀 Yay for unagi! Hehe. I really meant to pickle them in vinegar! Yeah I wasn’t real impressed with the brown rice sushi, but maybe it was how it was made or the type of brown rice or something…if you come up with a way to make it good, let me know! Robert-Gilles – I’m not very fond of pickled foods, but I’m sure Son would love them that way! This is just the most delicious looking thing IÃ¢â‚¬â„¢ve seen in ages. I canÃ¢â‚¬â„¢t wait to make it! Yum! Wow, I really like this roll a lot. I think I’ve seen it called the “dragon roll” elsewhere but it usually has teriyaki sauce drizzled over it. 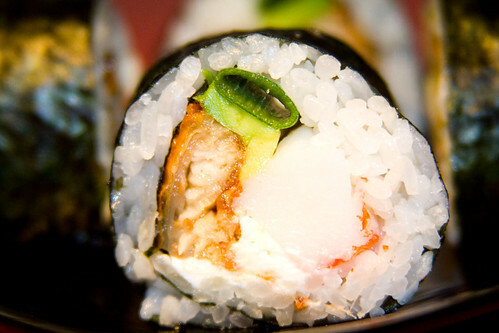 Delicious stuff, now I really feel like making sushi tonight! Your sushi posts are making me HUNGRY!